My guilty pleasure is beauty products – skin + body care, make-up, fragrances, nail polish – I’m in! My recent obsession has been on creating the perfect skin care routine. Ok not recent, this has been an ongoing quest. My skin is not bad, but could be better – hyper-pigmentation be damned! I’ve tried all types of creams, potions and lotions, everything from Prescriptives to La Prarie. On a recent jaunt to Sephora, for an angled eyeliner brush, I spied an end-cap of face and eye masks, something for every skin malady. 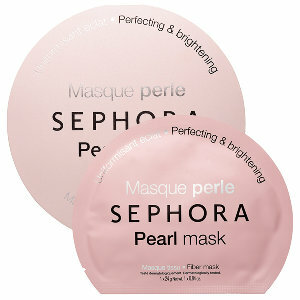 My choice, the Perfecting & Brightening Pearl Mask in the pretty pink packaging. You should know that I am also drawn to packaging, the more minimal the better. A lot of products come home with me because of the packaging, but I digress. It was a week or so before I made time to try the mask. Honestly, I was somewhat leery, but let me say, I had a change of heart. Wednesday was a free night, perfect for a “pretty party.” I carefully read and followed the directions. Unfold the mask – check; apply the mask to a clean and dry face – check; and after 15 minutes remove the mask and gently massage, allowing the product to penetrate the skin, no need to rinse – check. My first concern was that the mask would be flimsy, meaning that it would tear while trying to remove from the packaging; but nope, it’s made of fiber, no tears. It was also easy to apply, and covered the entire surface of my face with a little extra mask for under my chin. I have to say that I looked like The Mummy, but that’s the price of beauty. You can find a pic on Sephora’s Beauty Board, I don’t want to scare you away. But what I loved that most is that you could “feel” the ingredients working – natural origin white pearl, which is said to even out skin tone, and broccoli extract for clarifying. Personally, I like to feel a little tingle in my products. There was also a cooling/soothing sensation. Once I removed the mask there was product left on my face which, following the directions, I massaged into my skin. I immediately looked in the mirror and my skin looked healthier and brighter (glowing) – pores significantly smaller. Now I’m no fool and know that bathroom lighting is not true lighting. But since it was not yet dark on the East Coast, I took my hand mirror outside on the deck to take a look, still pleased. The very next morning I awoke and went to the mirror to see if I was still pleased with the results, and yep. Is my skin cured of its ails? Of course not. But, 48 hours in am I still pleased? Yes. I will certainly add this to my weekly skin care routine. And by the way, the price point is $6.00. Yesterday, did a supermarket sweep through Sephora and picked up the companion Perfecting & Brightening Eye Mask. I will post a follow up review on the eye mask in the next week or so. This is only one of several face masks available at Sephora. Peep the selection here – Sephora Face Masks. Do you mask? If so, leave a comment and share your experience. I recently picked up one of the other formulations. I am even more excited to try it after reading this! Will let you know how I goes. Awesome! Kimmie, what formulation did you pick up?